It’s simple really. Homemade ice cream sandwiches. Chocolate dipped. Sprinkles. But first! I have to tell you about a way that you can try one of my treats, if you live in the Seattle area. Do you know about Savour? It’s a fabulous specialty foods store in Ballard. In addition to having a wide selection of carefully selected and very fine goods, they also have an incredible cheese counter (burrata! ), and prepared foods. They serve sandwiches and quiches all day and really the place could not be any lovelier. My friend Julie (she of Julie’s Salad) works there and has started a new program called Savour September. 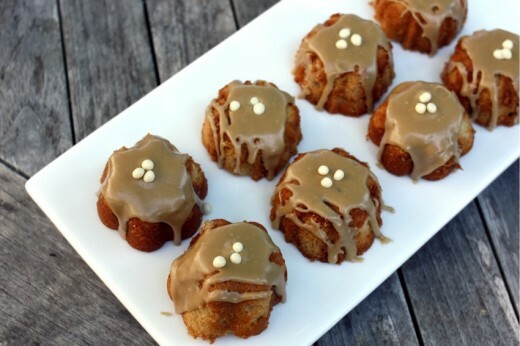 Each week, the store will feature a local food blogger and a treat of their choice. I am the first! So, if you would like to try my now-famous-and-much-requested Brown Sugar Pound Cake in mini form, head down to Savour. And say hi to Julie! We had some friends over for Labor Day. We were 8 adults and 8 kids. I needed to make a cake to thank our friend Brad for fixing my oven but I also wanted to make something special for the kids. Few things are better than seeing a child’s entire face light up at mention of a special dessert. Soon after photographing these treats, the kids descended on them. Some asked that they be cut into slices because they couldn’t get their mouths around them. Others (my Spencer included) just chowed right down on them. I sat with the kids. The girls all eyed me carefully. “Did you make these?”, they all asked, one and then another and then another. Shock and awe. What a great feeling. These are huge sandwiches and one by one, the kids brought the remnants into the dining room so the adults could taste them (except Spencer, who was the 2nd youngest kid there and the only one to finish his sandwich). I’m glad I got a taste because these are really good. I mean, of course they are. They are homemade ice sandwiches for crying out loud. But I was surprised by how well they turned out and by how good the cookie part was. This is a surefire way to win fans young, middle (ahem), and old. Preheat the oven to 325ºF. Line a 13x9x2 metal baking pan with foil, leaving 1-inch overhang on long sides. Lightly coat with nonstick spray. Whisk flour, baking soda, and pinch of salt in medium bowl. Melt butter in medium skillet over medium heat. Cook until milk solids on bottom of pan turn deep golden brown, stirring often, about 5 minutes. Transfer browned butter to small bowl. Place sugar and corn syrup in large bowl. Pour browned butter over. Whisk to combine (mixture will not be smooth). Whisk in egg yolks and vanilla. Add flour mixture; stir just to blend. Transfer soft dough to prepared pan; press into an even layer. Bake cookie layer until golden brown around edges and sides are just beginning to pull away from pan edges, 15 to 17 minutes. Cool completely in pan on rack. Using foil overhang as aid, lift cookie layer from pan and place on work surface. Place sheet of plastic wrap lengthwise in same pan, leaving overhang on both short sides of pan. Place another sheet of plastic wrap in pan, leaving overhang on long sides of pan. Cut cookie layer in half crosswise. Return 1 cookie half, top side down, to pan, placing snugly in 2 short end of pan. Slightly soften ice cream in microwave in 15-second intervals. Spread ice cream evenly over cookie in pan. Place second cookie half, top side up, atop ice cream, pressing slightly to adhere. 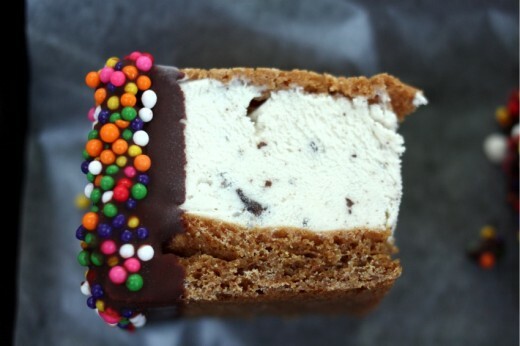 Fold plastic wrap up and over ice cream-filled cookie. Freeze until firm, at least 4 hours. Line baking sheet with parchment paper or wax paper. Unwrap ice cream-filled cookie; place on work surface. Using serrated knife, cut cookie lengthwise in half, then cut each strip crosswise into 4 sandwiches (8 in total). Place on sheet; freeze. I am a fan…..and these look better than the magazine version! checking flights to seattle…i’m heading over RIGHT NOW. DANG. those look soo good. Now I’m jealous! I wish I could be one of the lucky fans in the Seattle area. Savour September sounds like a great idea, it must be exciting to be a part of it! Regular ice cream sandwiches would have won me, but chocolate dipped? Amazing! If I wasn’t your friend already I would want to be now! Well, you don’t need to do anything more to win my heart (been there, done that) but I’m always up for an ice cream sandwich! I wish I lived close enough that I could stop by and hang out with you at Savour! ohhh congrats. and yeah, of course you’re featured. Holy moly, those look so pretty! Way fancier than the store bought ones. I hope to be in Seattle next week and would love to stop by Savour. Congratulations on your pound cakes being sold at Savour! Wish I could come and buy some. That glaze looks amazing. And, these ice cream sandwiches are fantastic. The kids must have been delighted. 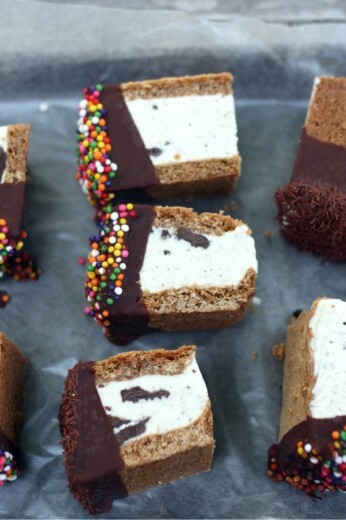 Holy these are the best looking ice cream sandwiches I’ve ever seen! !